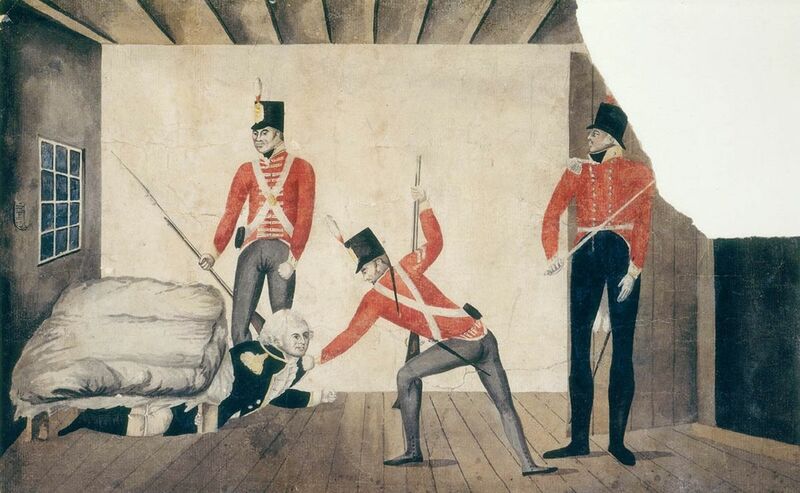 The Rum Rebellion is the only successful armed takeover of the government in Australia. William Bligh, well known for his overthrow in the mutiny on the Bounty, was a naval officer and the fourth Governor of New South Wales. He succeeded Governor Philip Gidley King in 1805, having been offered the position by Sir Joseph Banks. It is likely that he was selected by the British Government as governor because of his reputation as a hard man. He stood a good chance of reining in the maverick New South Wales Corps, something that his predecessors had not been able to do. Bligh left for Sydney with his daughter, Mary Putland, and her husband while Bligh’s wife remained in England. Even before his arrival, Bligh’s style of governance led to problems with his subordinates. The Admiralty gave command of the storeship Porpoise and the convoy to the lower ranked Captain Joseph Short and Bligh took command of a transport ship. This led to quarrels which eventually resulted in Captain Short firing across Bligh’s bow in order to force Bligh to obey his signals. When this failed, Short tried to give an order to Lieutenant Putland, Bligh’s son-in-law, to stand by to fire on Bligh’s ship. Bligh boarded the Porpoise and seized control of the convoy. When they arrived in Sydney, Bligh, backed up by statements from two of Short’s officers, had Short stripped of the captaincy of the Porpoise – which he gave to his son-in-law – cancelled the 240-hectare land grant Short had been promised as payment for the voyage and shipped him back to England for court martial, at which Short was acquitted. The president of the court, Sir Isaac Coffin, wrote to the Admiralty and made several serious accusations against Bligh, including that he had influenced the officers to testify against Short. Bligh’s wife obtained a statement from one of the officers denying this and Banks and other supporters of Bligh lobbied successfully against his recall as governor. This entry was posted in Uncategorized and tagged 1808, 26 January by Admin2. Bookmark the permalink.